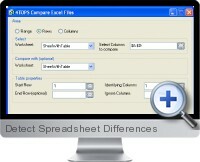 Detect Spreadsheet Differences for Excel (4TOPS Compare) detects differences between two spreadsheets and clearly reports where and what the differences are. Can compare both workbooks and worksheets within a spreadsheet. Easy to interpret reports using HTML. Differences in the HTML Analysis report and Visualization reports are hyper-linked to facilitate interrogation. Use with complete Microsoft Excel files, ranges or tables (both horizontal and or vertical). Supports table analysis with multiple identification of columns. Save comparisons settings to reapply later. Can be used as part of an automated process using API (ActiveX). Use in Excel VBA code to implement complex comparisons involving different areas. Button to automatically generate macro corresponding to current settings.